(Francisco Kjolseth | The Salt Lake Tribune) UDOT completes the first stage of the new Triumph Blvd bridge in Lehi, opening East to West traffic on Thursday, Nov. 1, 2018, as part of the I-15 Technology Corridor Project. (Francisco Kjolseth | The Salt Lake Tribune) UDOT completes the first stage of the new Triumph Blvd bridge in Lehi, opening East to West traffic on Thursday, Nov. 1, 2018, as part of the I-15 Technology Corridor Project. (Francisco Kjolseth | The Salt Lake Tribune) UDOT completes the first stage of the new Triumph Blvd bridge in Lehi, opening East to West traffic on Thursday, Nov. 1, 2018, as part of the I-15 Technology Corridor Project. (Francisco Kjolseth | The Salt Lake Tribune) UDOT completes the first stage of the new Triumph Blvd bridge in Lehi, opening East to West traffic on Thursday, Nov. 1, 2018, as part of the I-15 Technology Corridor Project. (Francisco Kjolseth | The Salt Lake Tribune) UDOT completes the first stage of the new Triumph Blvd bridge in Lehi, opening East to West traffic on Thursday, Nov. 1, 2018, as part of the I-15 Technology Corridor Project. (Francisco Kjolseth | The Salt Lake Tribune) UDOT completes the first stage of the new Triumph Blvd bridge in Lehi, opening East to West traffic on Thursday, Nov. 1, 2018, as part of the I-15 Technology Corridor Project. (Francisco Kjolseth | The Salt Lake Tribune) UDOT completes the first stage of the new Triumph Blvd bridge in Lehi, opening East to West traffic on Thursday, Nov. 1, 2018, as part of the I-15 Technology Corridor Project. (Francisco Kjolseth | The Salt Lake Tribune) UDOT completes the first stage of the new Triumph Blvd bridge in Lehi, opening East to West traffic on Thursday, Nov. 1, 2018, as part of the I-15 Technology Corridor Project. (Francisco Kjolseth | The Salt Lake Tribune) UDOT completes the first stage of the new Triumph Blvd bridge in Lehi, opening East to West traffic on Thursday, Nov. 1, 2018, as part of the I-15 Technology Corridor Project. (Francisco Kjolseth | The Salt Lake Tribune) Miguel Jimenez, left, and Manuel Robles do patchwork as UDOT completes the first stage of the new Triumph Blvd bridge in Lehi, opening East to West traffic on Thursday, Nov. 1, 2018, as part of the I-15 Technology Corridor Project. (Francisco Kjolseth | The Salt Lake Tribune) UDOT completes the first stage of the new Triumph Blvd bridge in Lehi, opening East to West traffic on Thursday, Nov. 1, 2018, as part of the I-15 Technology Corridor Project. 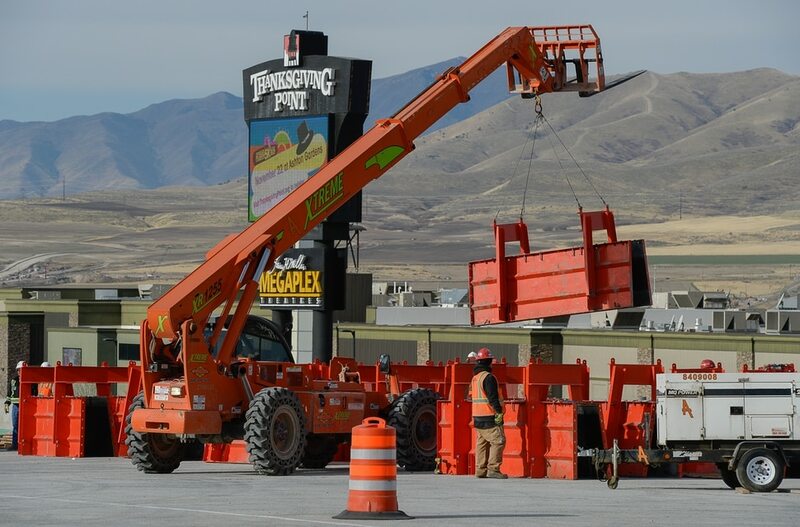 Lehi • The Utah Department of Transportation is delivering a Halloween treat for commuters who battle scary congestion in the rapidly growing Silicon Slopes area. 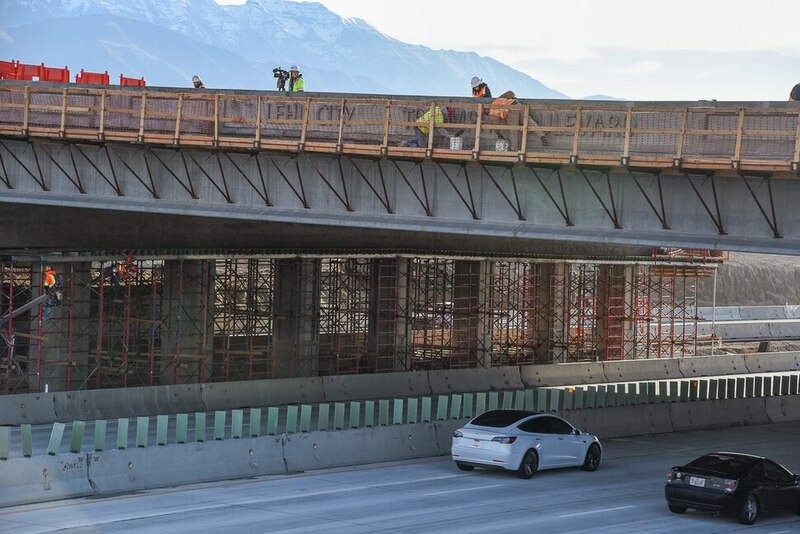 On Thursday morning, a new bridge will open over Interstate 15 on Triumph Boulevard, the first major milestone of the $430 million I-15 Technology Corridor Project. Other features of the project include widening the freeway from four to six lanes, adding frontage roads, replacing 50-year-old deteriorating pavement and rebuilding bridges and major interchanges. 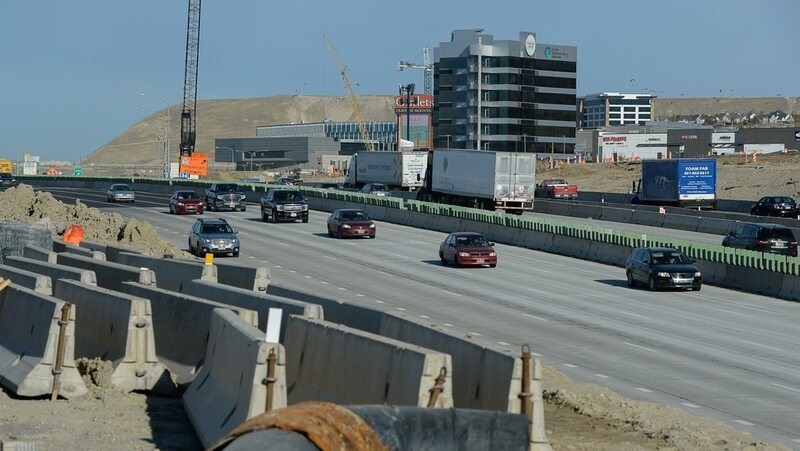 “It has a been a Herculean effort by crews to get this bridge started and completed in just six months,” said UDOT spokesman John Gleason, as crews showed off the new facility to the news media on Wednesday. It provides another east-west connection over the freeway between parts of Lehi’s Silicon Slopes. Current I-15 interchanges at the Timpanogos Highway and 2100 North are often jammed in part because of east-west traffic trying to flow through them. The new bridge will open with one lane in each direction, plus a turning lane. Eventually, it will have five lanes plus sidewalks, said Boyd Humphreys, UDOT’s construction manager for the project. The overall Technology Corridor project is scheduled for completion in fall 2020. “As the project continues, we’ll be adding components” to help reduce congestion, Humphreys said. Gleason warns drivers that the project will continue to shift lanes in various traffic patterns in coming weeks. “So be aware. Be alert,” he said.